Where classic horror, science fiction and mystery fans and professionals meet. Find out about our October 2018 Show: CLICK HERE! Find out about our August 2019 Show: CLICK HERE! 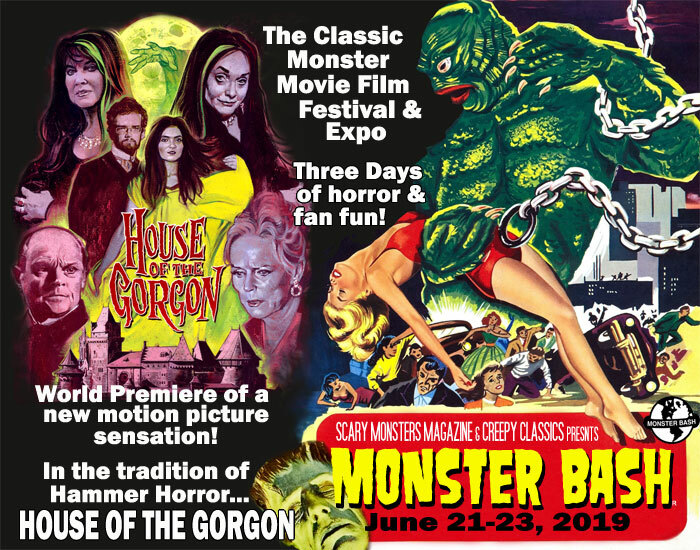 CLICK HERE for the June MONSTER BASH preview trailer. Make sure to ask for the MONSTER BASH discount room rate at the host hotel, the Double Tree, Mars, PA! Get ready to Monster Bash with all your classic monster friends! Please note that this is a family show with kids under 12 admitted FREE with adult. Events, schedule, guests, location are always subject to change. Contact Monster Bash - CLICK HERE! Did you grow up in the 1950s-1970s listening to pop radio? Well, it's back, small town classic radio. CLICK AND LISTEN WHILE YOU SHOP! "Monster Bash" is a registered U.S. and international trademark.